On a soggy autumn day in late October, a group of university students stood by the edge of an orange-tinted creek in the southeast Ohio village of Corning, a place built during coal mining’s boom days and now struggling amid a loss of jobs and population. As the group listened, watershed specialist Michelle Shively explained a plan to make the water here run clear: take the orange sludge and turn it into paint. Beside them, water laced with iron oxide seeped out of an abandoned underground coal mine at a rate of around 1,000 gallons a minute. The minerals raise creeks’ acidity and settle on their beds, killing off habitats for fish and other freshwater species. It’s a problem that has long plagued Appalachian communities whose economies have depended on commodities. But a pilot water-treatment facility launched last month in Corning aims to show that the pollution can be turned into something usable, even beautiful, and that the process, developed by professors of engineering and art at nearby Ohio University, can scale up to an industrial level, bringing in money to clean waterways across the region and potentially providing a solution to one of coal country’s most persistent environmental challenges. The process captures polluted mine water from the discharge site here at Sunday Creek in Corning and carries it to the top of a series of tanks arranged step-like next to the creekbed, at the edge of a small village park. As the water filters down through the tanks, the iron oxide precipitates out, leaving clean water to run back into the creek. The iron settles at the bottom of a final tank where it is collected, dried, baked and ground into pigments used to make paint. Shively, a Sunday Creek watershed coordinator at local nonprofit Rural Action, has been collaborating on the project with civil engineering professor Guy Riefler, who conceived of the project in 2010, and artist and art professor John Sabraw, who has helped refine the pigments and find potential markets for the paint. For years, they’ve been developing the process in a lab. 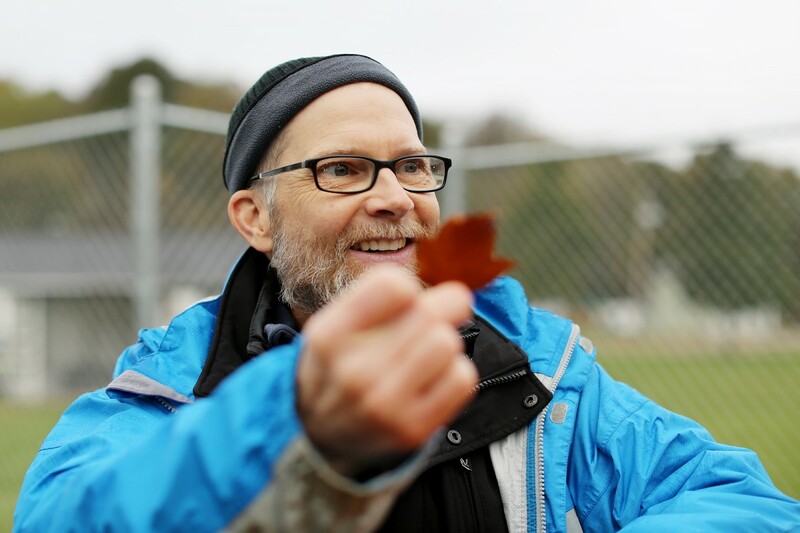 Now, with support from the Sugar Bush Foundation, which connects Ohio University to local communities, and the Ohio Department of Natural Resources, they’re putting it to the test. “We didn’t get in this to try to sell paint or to make a paint company; that was just the means to the end,” Shively says. The shared goal was clean waterways, but the team couldn’t extract the iron without finding a way to dispose of it, she says. Other systems landfill the minerals or mix the water with lime to reduce its acidity. But that all costs money. “By changing our perspective and looking at how we can use [the iron oxide] as a commodity, now we’re able to sell it and make enough money to run the plant, to clean the water and potentially make a profit and expand to other sites where we can clean more water,” Shively says. If the team can prove that their process works, they could win over the community and potentially extend it to mining companies that could use it to treat the water that comes out of their sludge ponds. They could also draw positive attention to a region too often associated with blight, addiction and joblessness. “Like ‘OK, this stream has been orange for 100 years, but you’re going to clean it up? OK, go ahead and try,’” Shively says. Riefler embarked on the project after learning about another mineral-harvesting system in Pennsylvania. But that system wasn’t going to work at the sites Riefler had in mind because the volume of water and iron was too great. So he drew on his engineering experience. Then he went in search of Sabraw, who had studied pigments and started incorporating sustainable materials into his art work. Sabraw says the samples Riefler first showed him were thick and chalky, the color of “desiccated peanut butter.” But after years of constant tweaking, he honed in on a product he felt comfortable shopping around to potential buyers. He convinced Gamblin Artist Colors, an oil paint producer in Oregon, to create a limited run of artist-grade paint from the pigments, and in the spring, he led a Kickstarter campaign that sold hundreds of tubes of the “reclaimed earth” paint to help fund an art wall around the plant explaining how it works. On a recent Friday, Sabraw dipped a five-gallon bucket into the final collection tank and pulled up the first batch of pigment to run through they system. “It makes a paint,” he said while drying out the ochre-colored sample in his studio. When the pigment is baked at different temperatures it produces colors ranging from goethite, a brownish-yellow in high demand in the concrete and landscaping industries, to a deep violet. Blocks of it sit in petri dishes surrounded by samples of pigments sent to Sabraw from around the world, some as far away as Tanzania. Around 1,300 miles of streams in Ohio have been polluted by what’s known as acid-mine drainage, or AMD, leeching from a maze of coal mines dug before passage of the 1972 Clean Water Act. That law requires companies to treat their wastewater to a certain standard, but because the mines here were abandoned before those laws took effect, no one has taken responsibility for cleaning up their run-off. Riefler argues that the region has also been overlooked because it is rural, poor and lacking political clout. Since the early 2000s, treating drainage into Sunday Creek has been a priority of the Department of Mineral Resources Management at ODNR, said Ben McCament, a program administrator with the department’s abandoned mine land program, which focuses on restoring streams and constructing AMD remediation projects. But, he said, it hasn’t been feasible to treat the acid mine drainage at Corning and a site further downstream called Truetown due to high costs and current available technology. “With the process that Dr. Riefler has developed, and by creating a potential revenue stream, the project has the potential to create a sustainably funded treatment system that could improve water quality in the entire 20-plus miles of Sunday Creek,” McCament explained. The department is currently working with Rural Action and Ohio University to apply for funding from a federal AML pilot program that allocated $10 million to Ohio in 2018 for abandoned mine land reclamation work designed to spur economic and community development in areas most impacted by the decline of the coal industry. McCament says the project could secure about half of the funds needed for a full-scale system – roughly $3.5 million, allowing DMRM to conduct much of the site development permitting, hire a firm to design the facility and reclaim existing channels and mine features. While the pilot facility will treat less than one percent of the water coming out of the Corning seep, which Riefler estimates will produce a pound of pigment a week, a full-scale facility at Truetown — one capable of treating all the water — would produce around 4,000 pounds of pigment a day. At a market rate of $1 a pound, the sale of the pigment would help fund the water’s clean-up and bring a handful of jobs to the area, as well as associated trucking and education opportunities. It won’t make up for the jobs lost in coal, but it’s part of the puzzle, says Shively, and the fact that it pays for itself is vital. Sabraw says demand exists beyond artist-quality paint, with the global pigments market projected to grow alongside the growth of the construction industry. The team will use the pilot to assess costs and begin marketing the product to big paint buyers. A full-scale facility would offer other possibilities too. The team has discussed offering tours or using it for aquaculture or as a demonstration site for sustainable agriculture practices, nature trails, a sculpture garden. Iron oxide pigment in Ohio University art professor, John Sabraw’s studio, Friday, October, 26, 2018. The process won’t be ideal for every discharge site and will need to be amended to deal with different mineral content — the seeps in Sunday Creek are almost entirely iron oxide. But the team is convinced it will work as intended and that as a story of collaboration and restoration it will resonate. “If you could say Corning is where it all started … that would really get a lot better press to us and get things going,” said Scott Moore, a member of the village council who grew up in Ohio and worked as a surveyor at a mine in northern California before moving to Corning in 2011. Cleaning up water that could run orange for more than a century is something Sabraw says not only could help give the community back it’s sense of place, but the way the team is melding science and art to break down barriers could also serve as a model for future collaborations. “I think that when you don’t talk about doing things a different way, but you actively execute it in a community as a partnership with the community, I think people are interested in that story,” he says.